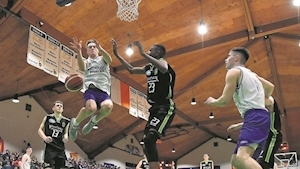 The Hannigan brothers — James and Scott — lit up the National Basketball Arena in Tallaght yesterday as they powered Gaelcholáiste Mhuire AG to U19A Boys Subway Schools Cup glory. The pair hit 53 points between them in a 68-79 victory over Mercy Mounthawk. Their scoring coupled with a superb display from David Lehane, secured a deserved title for the Cork side.